Our workshop aims to get young people excited and interested in culture and heritage by integrating historical information with modern technology and educating through creativity. We believe we can instil a sense of curiosity and respect for times gone by using this approach. 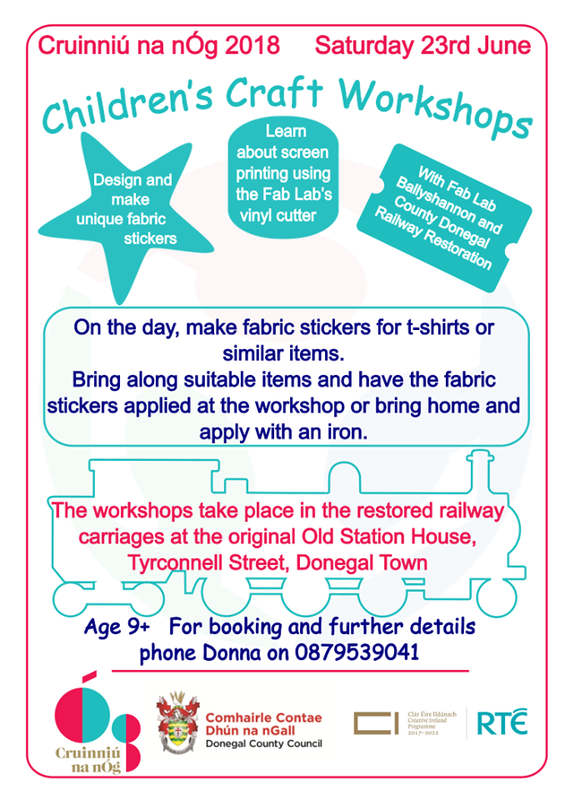 The workshops will involve using a vinyl cutter to make multi use fabric stickers that can then be applied to t-shirts, tote bags or other suitable fabric material. Participants will be shown how to use computer software (Inkscape) to create unique designs which are then transferred to the vinyl cutter for cut out before being heat pressed onto fabric. Participants will have an opportunity to visit the railway Heritage Centre to generate ideas and the workshops themselves will take place in the beautiful restored railcars. All stages of the process from design to production will be covered allowing attendees to produce unique artwork for personal use. There will also be a practical demonstration of screen printing using vinyl transfers and participants will have the opportunity to use this process to screen print artwork. There are three workshop sessions during the day. Booking is essential as places are limited. Please call Donna on 087 9539041 to reserve a place.